Sewers that collect both storm water and sanitary wastewater in the same sewer are known as combined sewers. 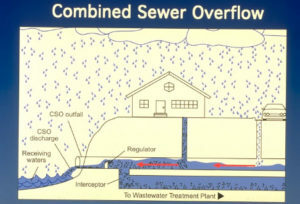 During heavy rains and large snow melt, combined sewers do not have enough capacity to carry all of the storm water to the treatment plant. 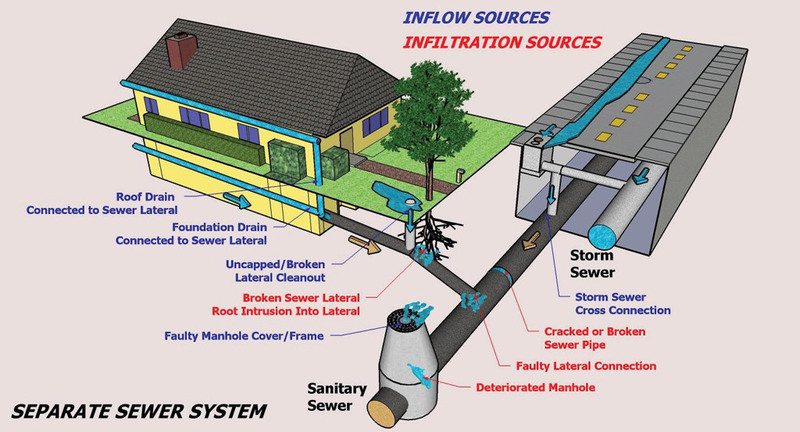 In this case, the combined storm water and sanitary waste water overflows untreated into a body of water, creating a combined sewer overflow. For communities that have combined sewers, overflows can occur when the system is overwhelmed by stormwater, causing untreated wastewater to discharge into the Rouge River. 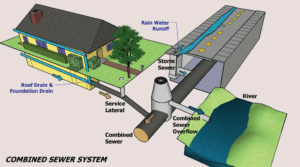 Sanitary waste is combined with other materials that are carried off the surface during rain events and discharged to the river. 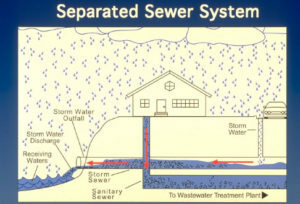 Separate: Many communities within the watershed are separating sewer systems so that storm water and sanitary wastewater collect in separate sewers. With a separated system, only water that runs through storm drains will reach the river. However, this water alone still carries a number of pollutants and is not treated. Add more retention: Many communities have built or are in the process of building large retention basins that can hold water during a storm. These systems, usually built underground with recreational features like soccer fields above, provide some screening and settling of solids, disinfection and slowly release to the treatment plant once the system can accept it.